What is it about: At the age of thirty-six, on the verge of completing a decade’s worth of training as a neurosurgeon, Paul Kalanithi was diagnosed with stage IV lung cancer. One day he was a doctor treating the dying, and the next he was a patient struggling to live. And just like that, the future he and his wife had imagined evaporated. 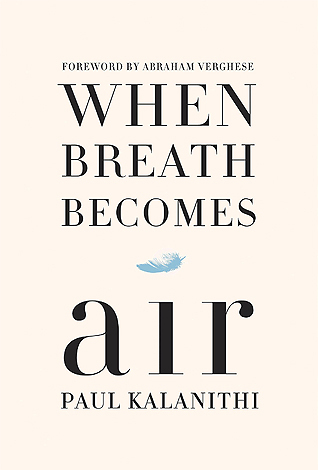 When Breath Becomes Air chronicles Kalanithi’s transformation from a naïve medical student “possessed,” as he wrote, “by the question of what, given that all organisms die, makes a virtuous and meaningful life” into a neurosurgeon at Stanford working in the brain, the most critical place for human identity, and finally into a patient and new father confronting his own mortality. What I Love: Die with dignity. It’s the clarion call of Paul Kalanithi’s words carried in his posthumously published book, When Breath Becomes Air. I ended up sobbing, with eyes swollen but it is a worth it less-than 200-page journey. Travelling inside the mind and heart and soul of a dying doctor, who had always searched for life’s meaning is enlightening and moving. Reading about death has always woke up the mortal in me. This is maybe why I am so fond of Mitch Albom’s books. Books about dying breathe life back to my purpose. My life’s meaning. What I Don’t Love Much: While the ending made me cry, it’s moving. So I have nothing to not like about this book. Wow, this sounds like a beautiful book! Yes, it sounds like it is. awwww. it’s definitely a tearjerker! i havent heard nor read that but im definitely taking note. I just so love Mitch and I cant help but see the connection. For some reasons, I’ve heard my book taste is too old for my age. but. i dont know the other way. hehe. Thank you, Gina! Yes. This is really so heartwrenching. hearttugging.